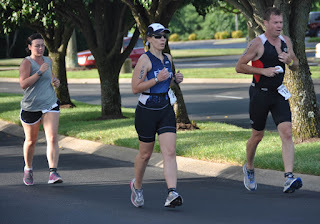 I FINALLY was able to race my first tri since Augusta last Saturday, June 23rd. 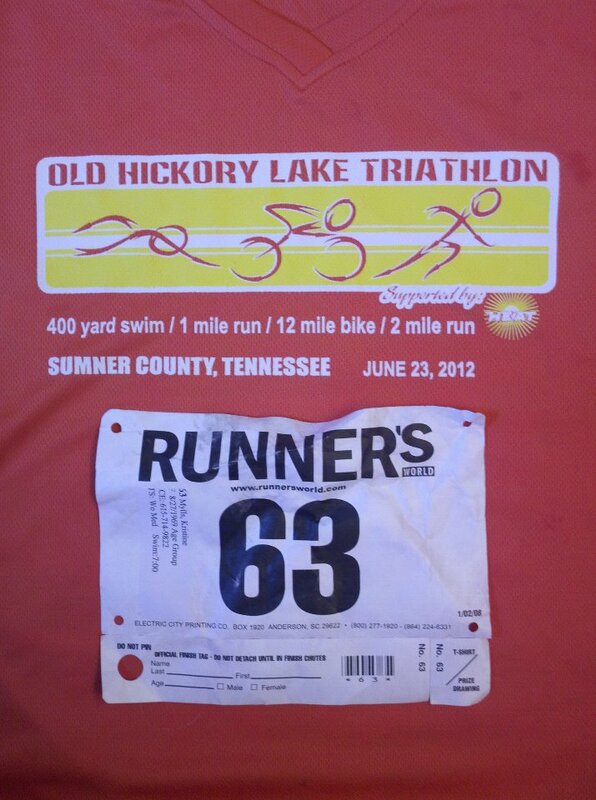 It was the Old Hickory Lake Tri up in Hendersonville. 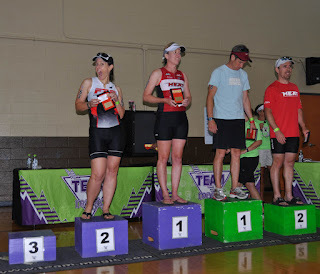 I was a little nervous, as it's been a long time since I've raced. Hopefully, I'd remember all that I was supposed to do. This race is a little different set-up from most tris as it's a 400-yard swim / 1-mile run / 12-mile bike / 2-mile run. 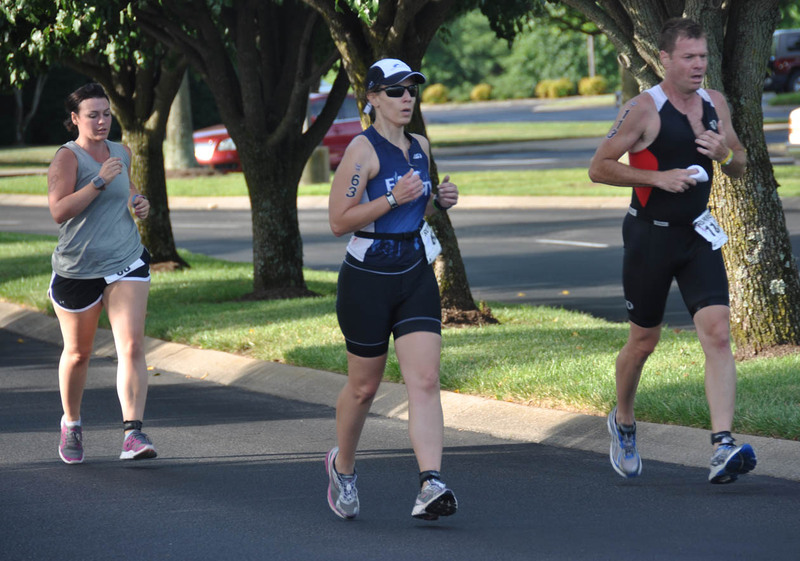 The lake is a mile away from the Sumner County YMCA, which is used as the main transition area. 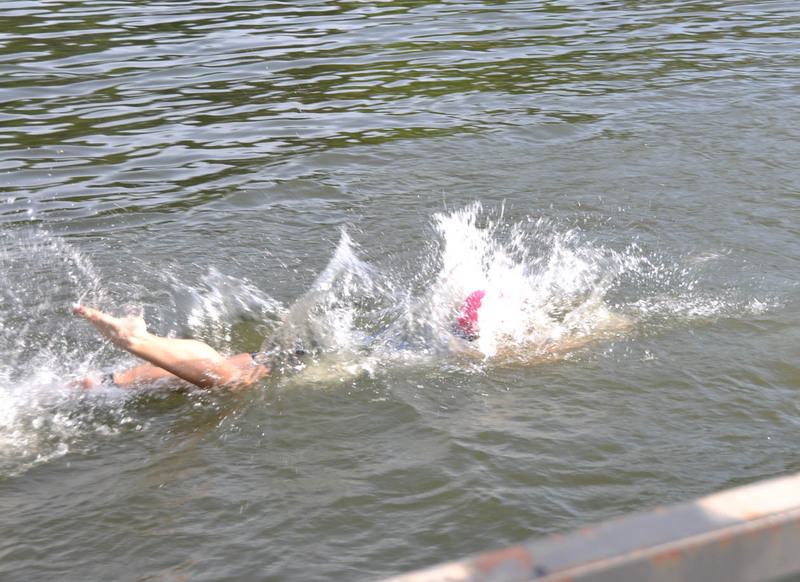 So you run immediately after getting out of the water. I wasn't sure how I was going to like it since running is, by far, my weakest event. I wasn't looking forward to having to do it twice. 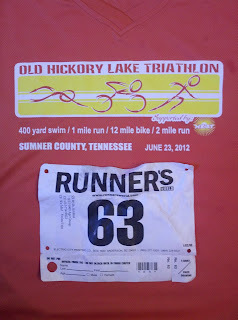 But being that my Mach Tenn was cancelled, and this was the only race before Chattanooga, I got up at 4:30 on Saturday and headed up to Old Hickory Lake to race. Due to some out-dated directions on the race website, we got to the race about 15 minutes before check-in ended. WAY too close for me. I'm not one of those "show up at the last minute" kind of racer. I'm a "show up too early and futz" kind of girl. 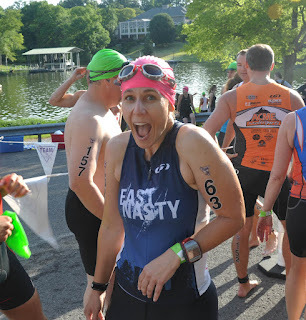 Needless to say, I was a little agitated before the race started, especially since the swim start was a mile away and I wasn't 100% sure where to go. But when I got to transition, I happened to be racked close to fellow East Nasty Jim Schwan, who, having done the race previously, gave me the lay of the land. So I got set up, hooked up with a couple of my FTP crew and headed down to the swim start. I can't believe I'm doing this again!! 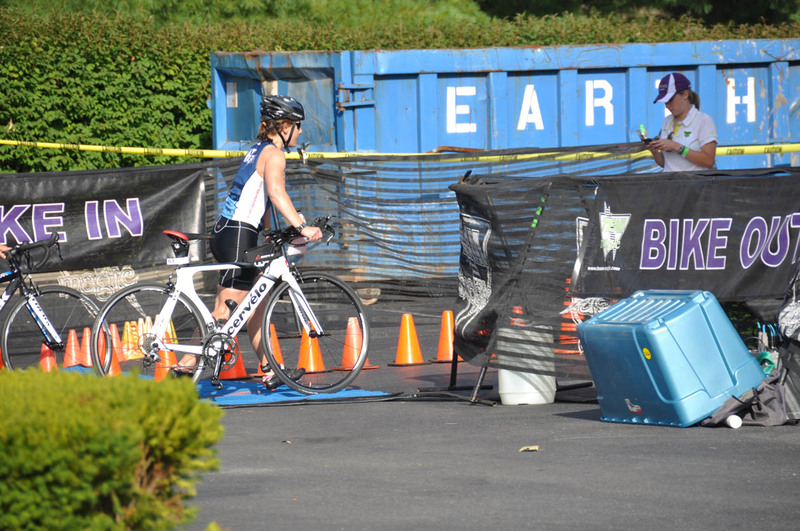 Since we had to run directly from the swim, the race organizers set up a transition area at the lake for our shoes. We also had bags where we could stash our swim caps and goggles. The race organizers would then, in theory, bring the bags back up to the main transition area where we could pick them up after the race. 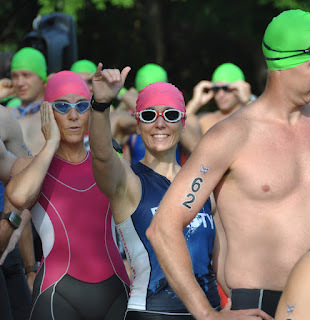 This kind of made me nervous because I LOVE LOVE LOVE my Zoggs goggles and really didn't want to lose them, but I also didn't want to run with them. So I set up my area with my shoes and sunglasses and headed down to the lake for line-up. This was a numbered start and I was number 63. WAY too early in the lineup considering I'm not that great of a swimmer, but I was happy to get my race started. On to the slimy boat ramp! Here I go!! Graceful, eh? The ramp into the water was really slimy, but the water wasn't bad once I was in. It was only 400 years so I figured I'd just swim as fast as I could. Good plan considering it's a race, huh? Go fast - duh. Kicker is that I generally don't swim that fast for that long. Holy cow! It's really, really hard! That swim seemed like it was NEVER going to end. 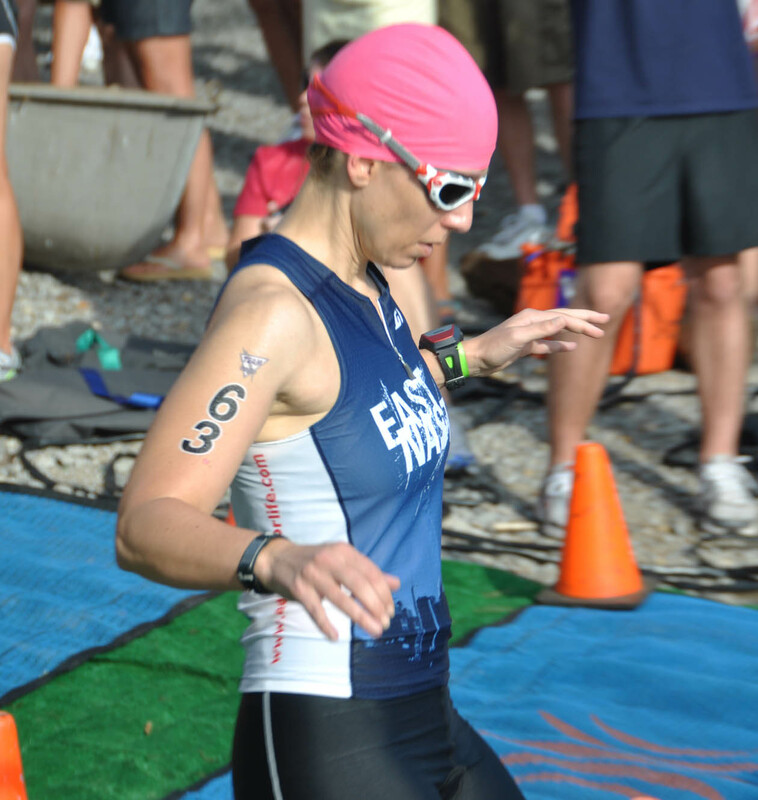 But less than 10-minutes later, I was trying to run back up the slimy boat ramp to the transition area. I dropped off my swim cap and googles, threw on my shoes and took off. Up a hill. You see, lakes are generally at the bottom of hills. This is something I never really thought about until I started doing tris, but it's true. And in this case, the hill was pretty severe. And it hurt. A lot. Given that I'm not the fastest runner - I got passed. A lot. It's a little disheartening, but what can you do? Season (in the EN kit) passing me on the first run. She would finish 3rd overall for women. Notice she's holding her goggles and cap. Wishing the one-mile run would end! After about 10 LONG minutes, I got to the bike transition. I took a couple of deep breaths and tried to remember what the heck I was supposed to do. Change shoes? Check. Hat off? Check. Helmet on? Check. 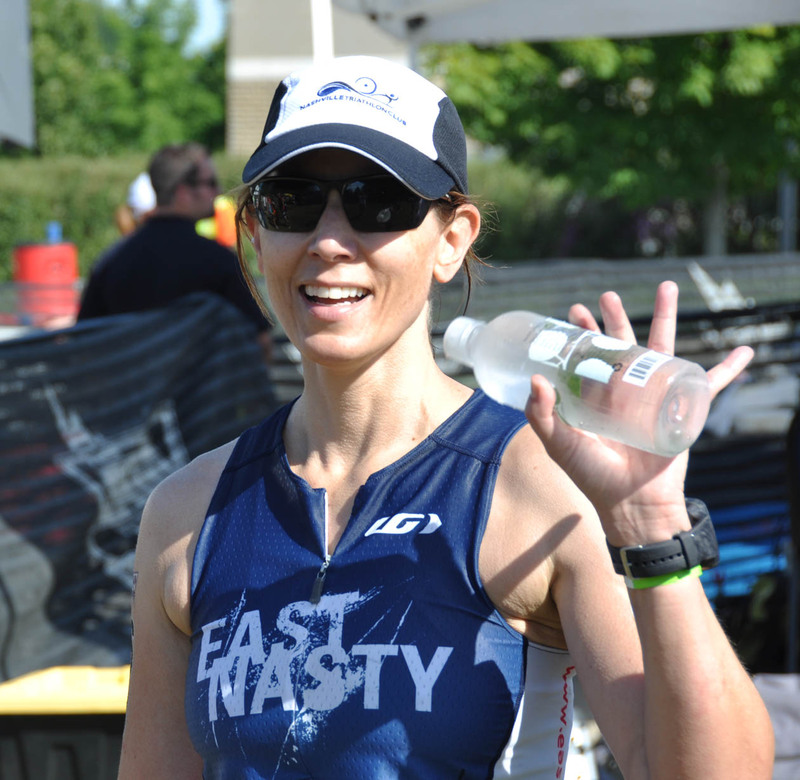 Nutrition wasn't an issue because the race was so short. So I took a few swigs from my water bottle, grabbed my bike and ran to the exit. The bike course wasn't bad. It was on one of the local highways and the roads were closed. It was great to not have to worry about cars. It was a little hilly because you had to go up highway ramps, but it wasn't too bad. I caught as many people as I could. I knew they would catch me again on the second run, but I had to take advantage of my strengths. The second run was actually better than the first. 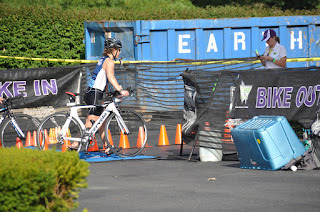 It was longer, but my legs felt fresher off the bike than they did out of the swim. The run was through a little neighborhood. Again, it was hilly. Probably one of the toughest run courses I've had to do. I'm thankful it was only for two miles. I slowed down a bit during the water stop to pour water over my head because I could tell I was overheating. Other than that, I kept a pretty solid pace even with the hills. It was hard though. And HOT. Lindsey from FTP caught me when cresting the final hill. She tapped me on the shoulder and said, "Let's go." She's a much better runner than I am so it about killed me to keep her pace, but fortunately we were going downhill. 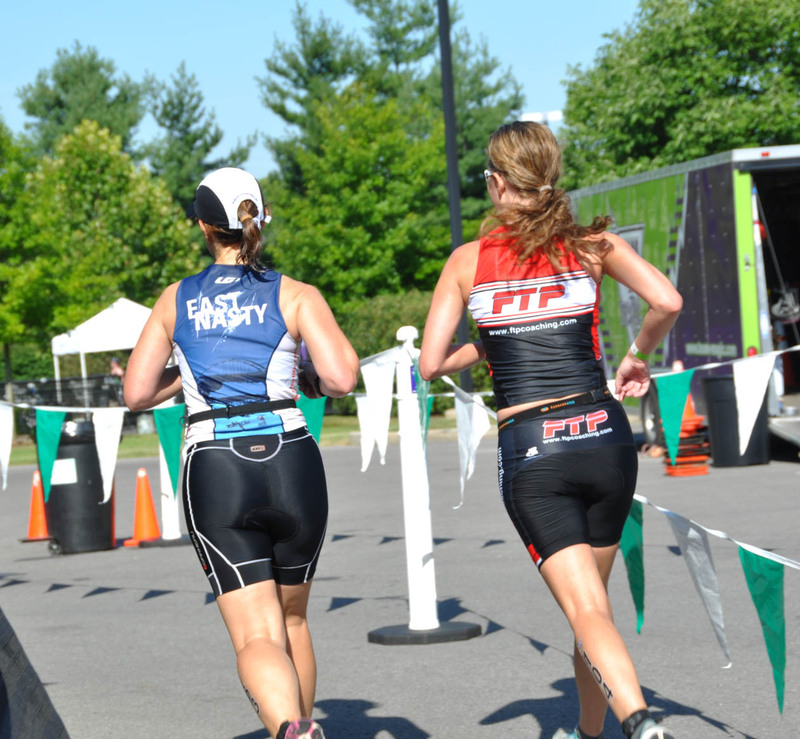 She paced me in until we crossed the line. Unfortunately, because of how the race was set up, Dudley couldn't get an crossing the line photos. 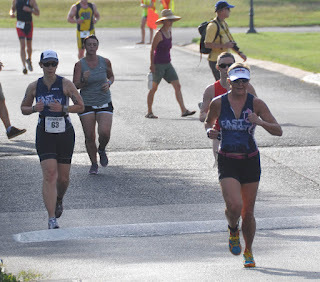 But here I am about a minute after crossing the line. I was so freaking hot - and not in the good way. Though Dudley and I were supposed to take off right after the race, I wanted to stick around at least until the results were up. Preliminary results were posted pretty quickly. It looked like I got fourth in my AG from the preliminaries. I figured that would stick since the only timed event was the last run. No way would I gain a podium spot based on my run, right? WRONG!! Look - that's ME! I got 2nd in AG!!! Yes, someone did get third. I think we had 14 overall in my AG. So it ended up being a really great race. Team Magic did their usual fantastic job as race organizers. Several of my friends placed in their age groups too. FTP ended up putting three on the podium. 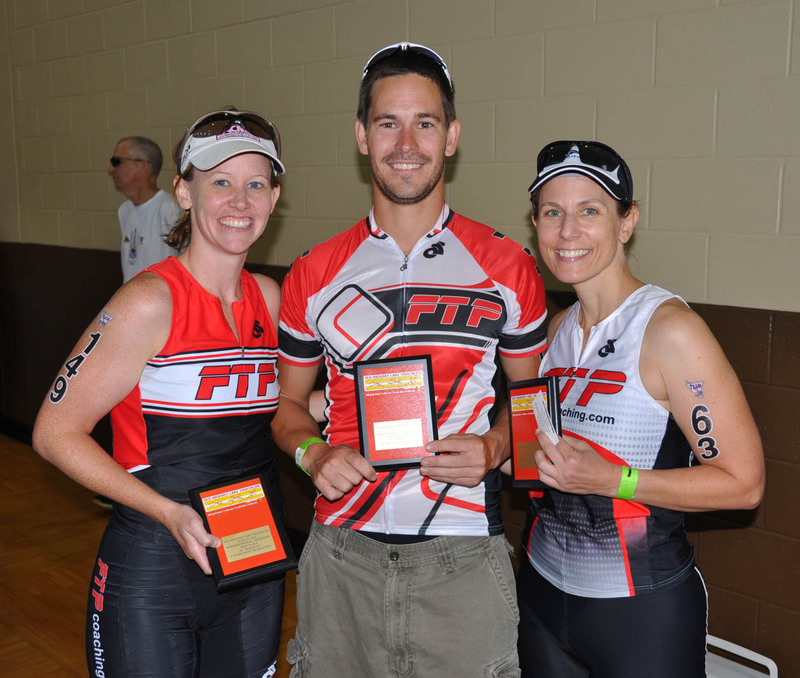 Jaime (1st AG), Andrew (2nd AG) and me. 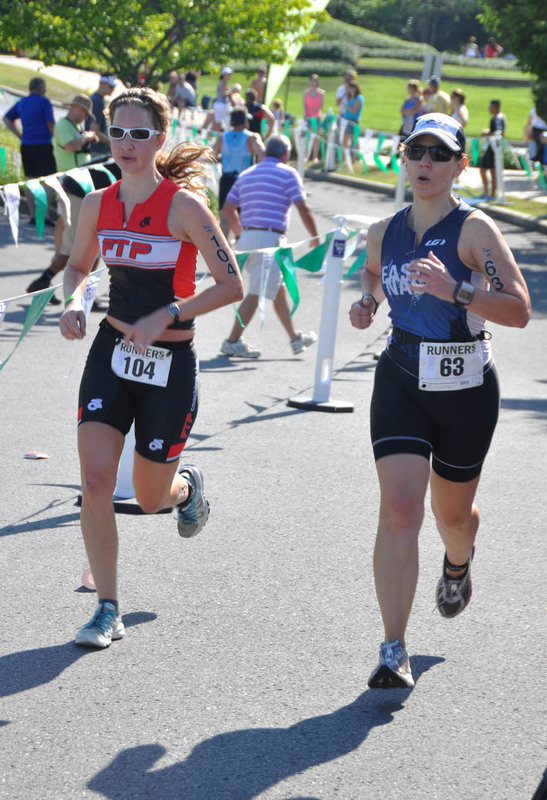 And Kathryn from the Sportsplex placed too! 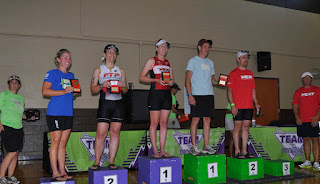 I was thrilled after coming so close on several races to actually make the podium. My run ended up being good for me, but still about 1-2 minutes slower per mile than the other masters women. Need to work on that. 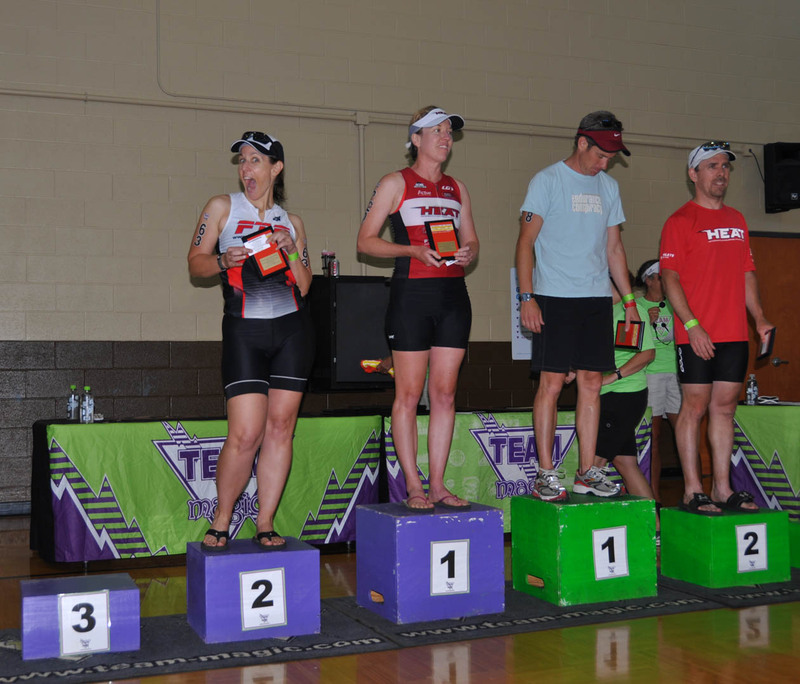 What was really cool is that my times for bike and swim were right there with the overall women's leaders. My time was actually better in two of the events. But - the run - not so much. Sigh. What also gets me is that I lost first by 12 seconds!! Remember that futzing I did at transition?! Yep - I know I futzed for over 12 seconds. Especially in T1 when I put my swimcap/goggles in the bag. Should have just run with them. Oh well. Lesson learned. I need to thank my ever understanding husband for sacrificing yet another weekend morning for me. 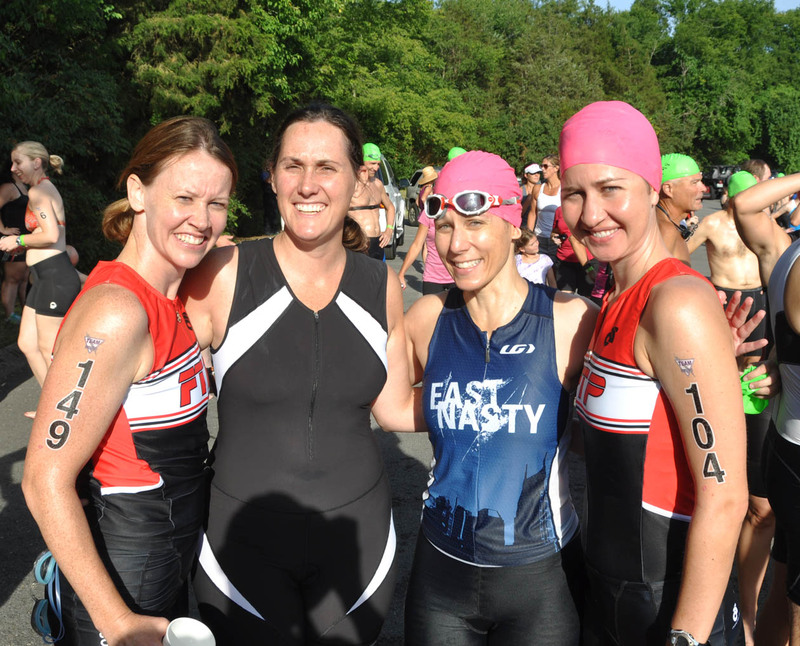 A shout-out to the East Nasty crew for always being there. 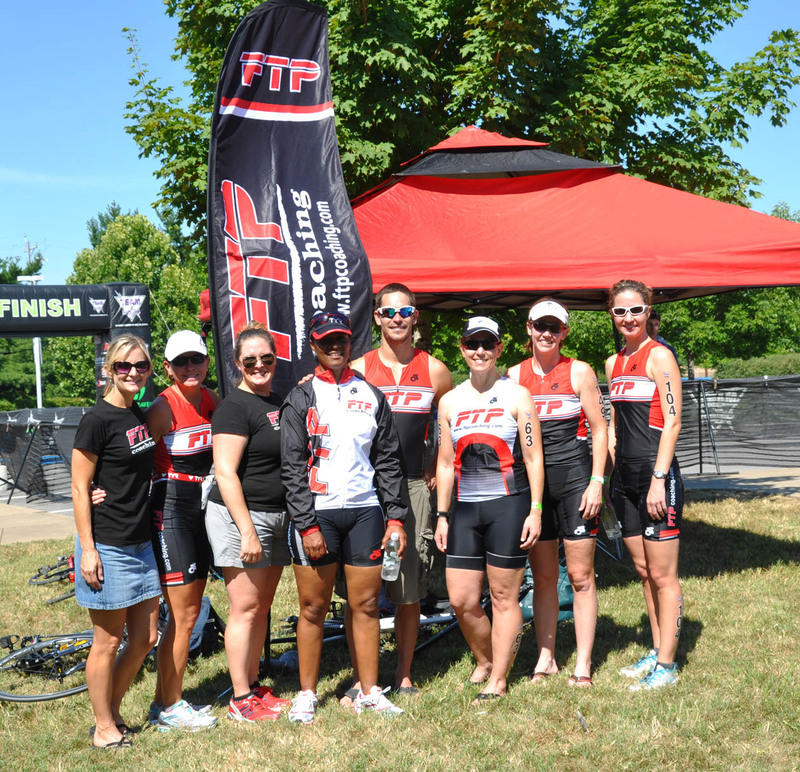 A big thanks also to FTP for the training and the support. 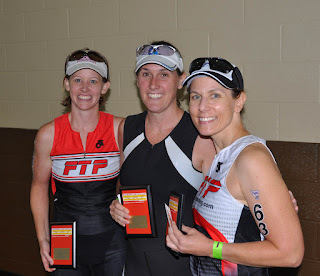 This was my first race as a member of their training team, and it definitely makes a difference to have a group there yelling for you. 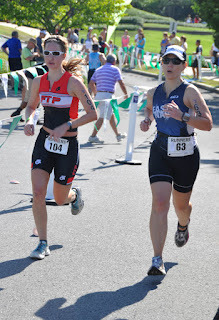 And a HUGE thanks to Lindsay from FTP for pacing me in. I only won 2nd by 24 seconds. Her pacing probably made the difference between 2nd and 3rd. Next up - Chattanooga. This was supposed to be a redemption race since last year's went so bad. But it's going to be over 100 degrees. So change of plans. Now I just want to get through it. We'll see how it goes! !